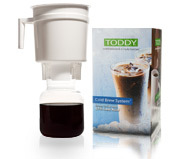 Synopsis: Just in time for the hot summer sizzling days, the Toddy Cold Coffee Brewers have arrived at our store. The cold brew process creates a perfectly balanced and distinctively smooth cup of coffee - served steaming hot or iced cold. You're invited to taste the Toddy difference: the same taste that has delighted coffee drinkers for nearly 50 years. has take long time istn't it?